Have you ever been to Ubud, Bali? 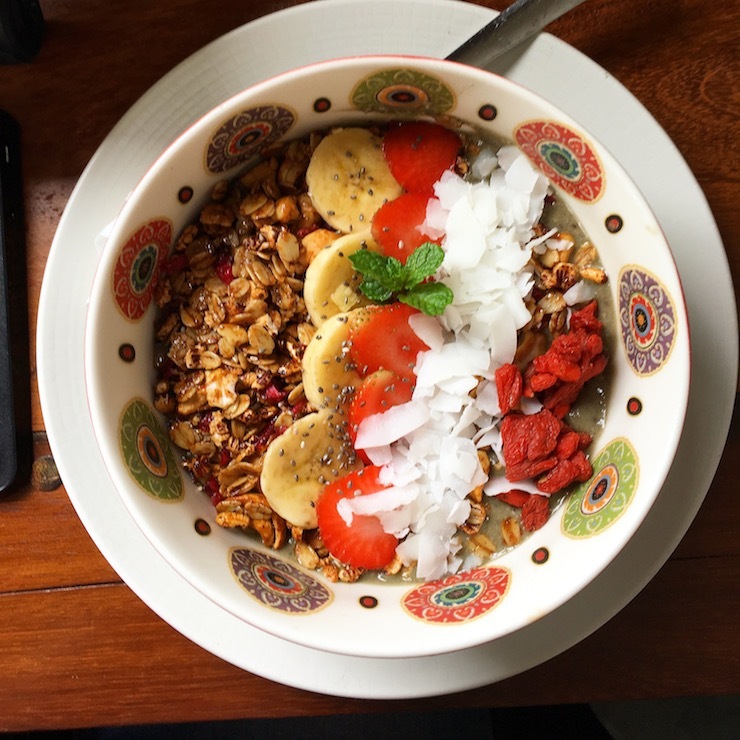 I was there last year, and I quickly learned why Ubud has a reputation for being a health nut’s dream: you can’t move around the town for health food shops, raw food restaurants, Buddha bowls, spirulina, kombucha and fresh fruit smoothies. Now, while I did my best to try everything with an open mind, I haven’t exactly gone out of my way to include kombucha and raw food as a regular part of my diet since I got home. That stuff is an acquired taste… and I did not acquire it. 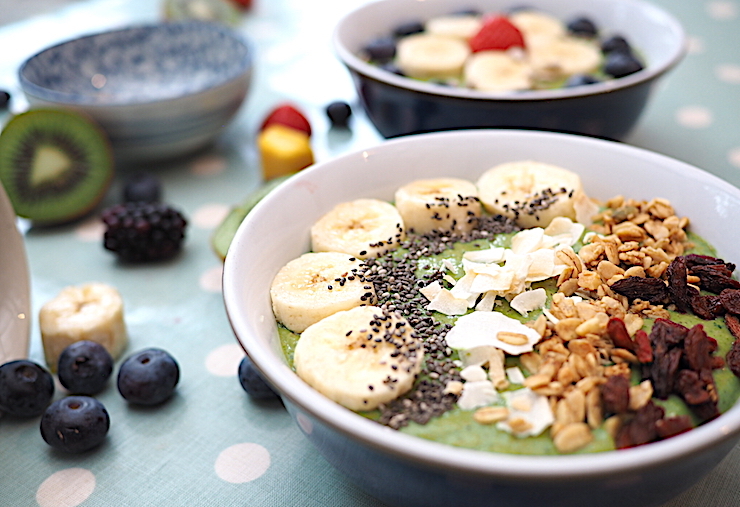 However… smoothie bowls? I am in love. I had one every day for breakfast in Ubud and they are DELICIOUS. Whoever first thought of taking the humble smoothie, making it ever-so-slightly thicker and then tossing in a bunch of munchable sprinkles is a genius. I’ve never had smoothie drink that keeps me feeling full for any longer than half an hour, but there’s something about eating with a spoon and actually chewing and crunching through different toppings that seems to tell my brain I’ve had a ‘proper’ meal. 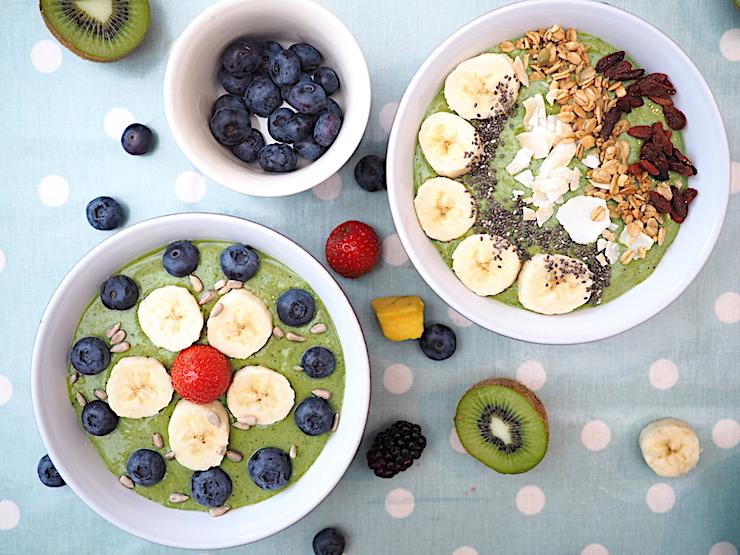 And as well it should – done the right way, smoothie bowls are absolutely packed with healthy nutrients and vitamins. As soon as I arrived home I started to miss those epic bowls of yum, so I started experimenting with different recipes to try to replicate my absolute favorite: the green smoothie bowl from The Green Window cafe. Isn’t it a work of art? It’s taken me a while to get there – I can only experiment on my Saturday cheat days because I’m following the Slow-Carb Diet – but after many, many failed attempts, including a tasty but extremely unappetising lumpy brown concoction (note to self: don’t try to mix red berries and green spinach) I have finally perfected my super-easy green smoothie bowl recipe. So, my friends, go forth and smoothie – and then go crazy with the toppings, because that’s the best bit! Nuts, seeds, fresh fruit, dried fruit, crumbled-up muffin/blondie/flapjack/breakfast bar, granola, cacao nibs, chocolate-coated raisins, chocolate-coated peanuts, unicorn sprinkles – go for your life and find your favorite combo. Every successful smoothie bowl contains a few key foundations: frozen fruit, healthy fats, and a liquid base – everything else is just a bonus. I LOVE the flavor of coconut milk so that’s always my liquid base of choice, but you could use almond milk, soya milk or even regular milk. For the absolute best results, try slicing up your bananas and freezing them in advance. Using frozen fruit in the base helps to thicken the smoothie and give it a nice chilled temperature without having to use ice. That said, if you want to use banana as a topping, keep at least one in the fruit bowl – that stuff goes brown and slimy when it defrosts (yuk), so keep fresh bananas as toppings and the frozen stuff for the green smoothie base. 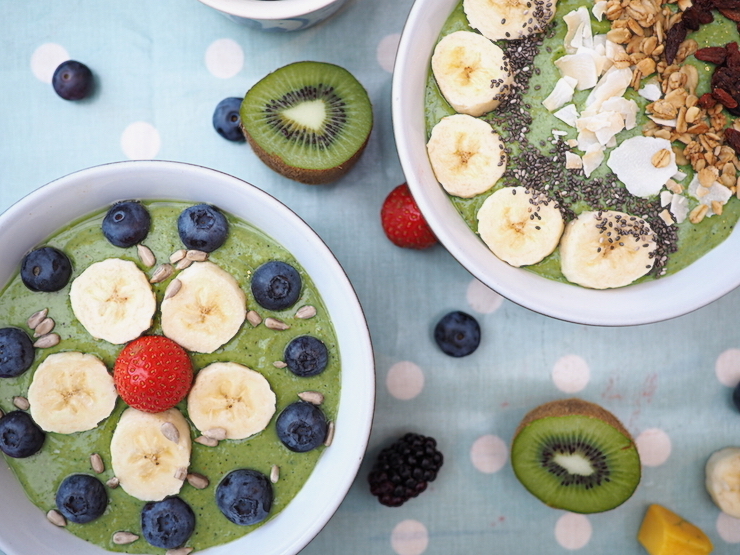 Whip up this super easy green smoothie bowl recipe in flash for healthy vitamin-packed breakfast. Add all the green smoothie base ingredients to a blender and blend until smooth. I only have a NutriBullet, so I tend to add a little of everything and then blend, add more and blend, etc but if you have a proper kitchen with a proper blender you can do it all at once! Taste the mixture and check the flavor and texture. Too sweet? Add more spinach and nut butter. A little bitter? Try more mango or kiwi. Too thin? Add another banana or a little more flaxseed.